Ever since you were a small child you have been getting advice. Of course, it began with your parents. Usually, their life experiences could be counted on to smooth your path through childhood. Some of us had older siblings who we could turn to and weigh things that had taken place in their lives with events going on in yours. When you got to school-age teachers and fellow students provided more help along the way. I could go on and on but I think you get the gist of what I’m trying to say here. Why do things the hard way? Like the old saying says, no reason for you to “reinvent the wheel.” There are experts out there who have the answers you are seeking (and some you don’t even know to ask about). A lot of the reason this website even exists is to do just that. 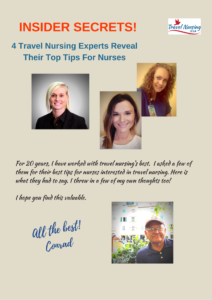 Providing you advice on travel nursing, using the experiences of men and women who have traveled the path, is the cornerstone of TravelnursingUSA.com. A few months ago I was pondering ideas for a free download I could create that would provide real value. A friend of mine suggested that with all of my years in this industry I must know a lot of experts in a lot of different areas of the business and maybe I should think of tapping that resource as a means of creating something of value for you. I hope you both enjoy and learn from it. Get it HERE.